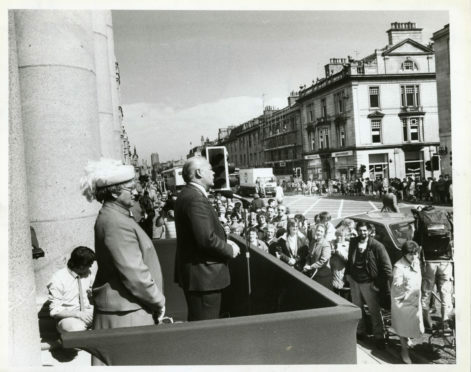 1986; Lord Provost Henry Rae speaks at the opening of the refurbished Music Hall in 1986. And the pioneering achievements of James Clerk Maxwell laid the groundwork for everything from Einstein’s theory of relativity to the creation of modern electronics. However, a new book about the Scot has revealed his hitherto secret past as a driving force in the construction of the famous Music Hall in Aberdeen’s Union Street during Maxwell’s time as a professor in the Granite City. The young Victorian was a key member of the British Association for the Advancement of Science organisation and was determined to persuade them to stage its annual meeting in the north east. So he was thrilled when it was agreed that the 1859 convention would be held in Aberdeen. But there was a glitch: the city (which only had a population of 35,000 in these days) had no venue which was suitable for the sort of large-scale lectures and discussions which were arranged at the event. None the less, this didn’t deter the protagonist of Brian Clegg’s work “Professor Maxwell’s Duplicitous Demon” and he set about making sure that Aberdeen created an auditorium which was worthy of hosting major occasions. As the author said: “With Maxwell among its shareholders, the Music Hall Company set to work on the rapid construction of a spacious venue in Union Street. “The imposing 50-foot-high internal space was capable of seating 2,400 people and is still a major feature of the cityscape today. However, there was a curious backdrop to the story, with the Music Hall Company continuing to send dividends from its proceeds to Maxwell at the long-defunct Marischal College through to the early 1900s, long after his death. Indeed, this led to the lawyers responsible for dealing with the payments eventually placing an advertisement in what is now the Press & Journal, asking for “Mr James Clerk Maxwell to come forward”. Best-selling author Peter May was in Inverness last week to promote his new book “The Man With No Face”. But, even as politicial stormclouds gathered over Theresa May, amidst the twists and turns of Brexit, he had his mind on weightier matters. May declared: “On this momentous day in British politics, I would like to re-open the debate on whether porridge should be taken with salt or something sweet. This was the catalyst for a lively discussion between the cognoscenti in the world of oatmeal. No doubt, the traditionalists will be horrified. Orkney’s John Rae is renowned as an Arctic explorer, but until now his considerable achievements as a land surveyor have been less well recognised. However, that has been rectified with the news that Mr Rae – who died in 1893 – has become a member of the Royal Institution of Chartered Surveyors, which has awarded him the prestigious posthumous title of Honorary Charter Surveyor. One of nine children, the peripatetic Scot was born at the Hall of Clestrain, which is currently being renovated after falling into disrepair. Mr Rae’s champions – who include Monty Python star, Michael Palin – would argue it’s no more than Rae deserves, considering how much he accomplished in his life. He began studying medicine at the Royal College of Surgeons and promptly accepted the post of ship’s surgeon on the Hudson Bay Company’s Canada-bound, Prince of Wales in 1834. It was in North America that Rae honed his skills as an explorer, map-maker and surveyor, while learning native tracking and survival skills from the indigenous Metis Indians. The search for a Northwest Passage to the East through the ice-bound waters of arctic Canada had been an obsession with British maritime powers since the 18th century and the success of Rae’s first expedition in 1846-47 in mapping the remote, ice-covered Gulf of Boothia was widely regarded as a significant contribution to the quest. For a long time, the Orcadian has been forced to languish in obscurity. But now, he is emerging into the spotlight.